They might not be able to tell us if their mouths are hurting, but by checking regularly we should be able to detect inflammation for ourselves. Observing good oral hygiene is not just about preventing yellow teeth and bad breath, but avoiding more serious health implications such as heart, liver and kidney disease, which both humans and dogs can develop. Mouth cysts and tumours can also appear where oral hygiene is poor and these can be extremely uncomfortable and can make eating difficult. Ideally, dogs should be introduced to brushing from an early age so they get accustomed to regular cleaning and learn not to fear it. In fact, if the process is positively reinforced with praise and rewards, your dog should actually come to enjoy it! Like us humans, regular check-ups are necessary whether you regularly brush your teeth or not. It is recommended that dogs have a dental check-up every 6-12 months to check the health of the teeth and gums and to look for signs of oral disease. Brushing your dog’s teeth needn’t be stressful for either of you, and following a few simple steps is all you need for successful brushing. If you don’t think you can brush your dog’s teeth without incurring an injury, it is worth asking your veterinarian to help you. Brushing is a gradual process that takes time to introduce to a dog, so don’t try to force it. Before you begin, make sure you have a toothbrush and toothpaste that are suitable for dogs. Bear in mind that using regular human toothpaste is very dangerous because it contains fluoride. First of all, make sure your dog is in the right frame of mind. By this I mean when your dog is calm and relaxed. The best time is usually after a long walk or period of exercise when your dog is going to be satisfied and resting. Set a routine where exercise is followed by teeth cleaning and then a treat or reward. Your dog is likely to be less anxious if brushing becomes part of its normal routine. If, however, your dog resists your attempts to brush its teeth, end the session and go back to it another time. You could also try OraFresh, a gentle and palatable oral hygiene paste, which can be added to food if applying directly to the mouth is not possible. Next, introduce the toothpaste by putting some onto the end of your finger and allowing your dog to lick it. Most dog toothpastes are specially flavoured for the canine palate so your dog should have no problems enjoying it. VioVet sells a range of toothpastes for dogs and cats, including ones containing active, plaque-fighting enzymes that help to maintain the healthy bacterial balance of the mouth. If your dog seems happy, try sliding your finger just inside the mouth or along the gum line to get your dog used to the feel of something against its teeth. 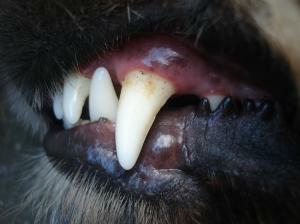 Apply different pressures to the gums to gauge your dog's reaction. At this point you can start thinking about introducing a finger toothbrush. These are like soft rubber thimbles that go over the end of the finger with a textured side for brushing. They are less intimidating than a toothbrush and are a good introduction point. Start by putting some toothpaste onto the brush and allowing your dog to sniff and lick it. If your dog seems comfortable, again, try and slide your finger inside the mouth. Be gentle, starting to concentrate on brushing the teeth you can easily reach. If this is successful, it may now be worth trying a proper toothbrush. Choose one specifically made for dogs, with angled bristles for brushing along the gum line. Place your hand gently over your dog's muzzle and try briefly lifting the lips. Hold them there for a second and then release the muzzle, giving your dog a treat for its cooperation. Repeat this exercise a few times before stopping. Do this every day, extending the length of time you are holding the muzzle, until you feel your dog is ready for a short period of brushing. Like you did with the finger toothbrush, start by introducing the toothbrush to your dog with a small amount of toothpaste. Even if your dog is curious about the brush, it should have no hesitation enjoying the toothpaste. Once your dog seems comfortable, try holding your dog's muzzle as practiced, lifting the lips and introducing the brush slowly. Talk in a soothing voice to reassure your dog there is nothing to fear. If your dog resists or shows signs of distress, release the muzzle and wait for a moment. Try again, but this time don't introduce the toothbrush. If your dog allows its muzzle to be held without fidgeting, reward it with a treat. Then try again with the toothbrush. After a brushing session, always reward your dog for its good behaviour. By doing this, you are teaching your dog that cooperation leads to a delicious treat and a happy experience, making it more likely to repeat the behaviour. Logic Chews are great as they come in palatable flavours and help to remove plaque from the teeth. They also contain antibacterial enzymes that rid the mouth of harmful bacteria and strengthen a dog's defences. Diet is central to oral health and many dog owners swear by the benefits of a raw food diet over a commercial one. The process of chewing through bones and meat is thought to keep the teeth strong and free from tartar and plaque. If a raw diet is not an option, feeding a dry kibble over a wet food is much better for teeth as they are strengthened through chewing and do not have wet food sticking to them and leaving soft deposits around the gum line. Feeding dental treats in conjunction with a dry food diet and regular brushing is the surest way of promoting healthy teeth and gums for dogs of any age and breed. I have four dogs and I clean their teeth with an electric toothbrush they love it, when I got my dogs they were all rescue and had a dental at the vets as their teeth we in very poor condition so I feel it very important to keep the dogs gums and teeth health, they fight to be first on the table to get their teeth cleaned, it also save on vet bills and the dogs having to be sedated, I have try dental stick but they don't work as good as a toothbrush. I also use a electric toothbrush to clean my dogs teeth and they also love having it done. I can also scrape any bits of tartar build up off as they will let me do this. Chews do help but brushing is better. I introduced my rescue dog to Logic toothpaste which she loves, so a lick of that then with a child's bamboo toothbrush ,first one side then a fresh lick and then do the other side. She always also tries to lick the top of the tube. WOW, I'd never thought about an electric toothbrush. Thanks. My two dogs both have a raw diet and no soft or sugary treats yet they still have poor/stained teeth. They vet thinks it could be something in their saliva and genetic (they're from the same litter). I brush using Logic but I've also found large marrow bones help. I am slowly building my dog up to brushing, he's doing well and I brushed his top both sides and front tonight, then stopped before he got fed up. He loves the liver flavour of the toothpaste. He used to be fed a raw diet and his teeth were great, but the diet didn't agree with him, he had ended up on a wet food that's quite sticky. So even though he does have Dentistix after dinner and natural treats including some raw bones occasionally, I still have to clean his teeth to keep them lovely.